Allow to soak rice & daal in water for 10 minutes. Meanwhile take peanut powder in one bowl addsome of ginger-garlic paste, garam masala, coriander, chilly , turmeric powder & salt. mix it well. Now add lemon juice & sugar, add very little water & make a thick paste of it. Slightly cut brinjal, tomato, onions, potatos from top & stuff them with the masala paste, do same with green chilly & tindora(just cut them horizontally so as masala can be fill nicely in it).even separate papdi beans & fill masala & try to bind them again. At this stage, all the vegetables are stuffed now. Take pressure cooker, add 5-6 tsp oil in it, once heated add cumin & mustard seeds, let them splutter. then add ginger garlic paste. Then add daal & rice. Add 3 cups of water. 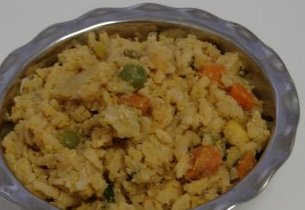 Allow to cook khichdi only up to 2 whistle.then remove the cooker from flame & allow to be cool. Some stuffed masala will come out from the vegetables & mix with khichdi, will give very nice taste to khichdi & stuffed & cooked vegis gives awesome taste.